"Kissing Test is the best kissing app for the iPhone." "Great way to make a woman laugh!" Are you a good kisser? Prove it! 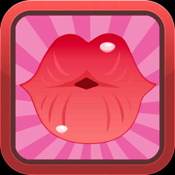 Kissing test is an iPhone app that lets you and your friends find out what kind of kisser you are. 2. Kiss the lips on your device's screen. 3. Your kissing-type will be analyzed and displayed! Kissing Test is a great ice breaker, and a great way to start up a conversation with someone you've just met. Kissing Test is also great for parties and groups! Just keep in mind, you may wish to clean your screen before sharing Kissing Test with friends! Are you a stud or a dud? Find out now!